Is it the case that MO is actually split into several communities which only communicate with each other through meta-activity but have no actual mathematical interests in common? on the other hand if there indeed are some symptoms of disconnectedness, this might be interesting generally, indicating some lack of communication in the MO slice of the mathematical community, and maybe something should be done about it. So could one e. g. use the data explorer to somehow measure connectivity of MO? There is some recent research related to clustering and the role of centrality on MathOverflow. Abstract. 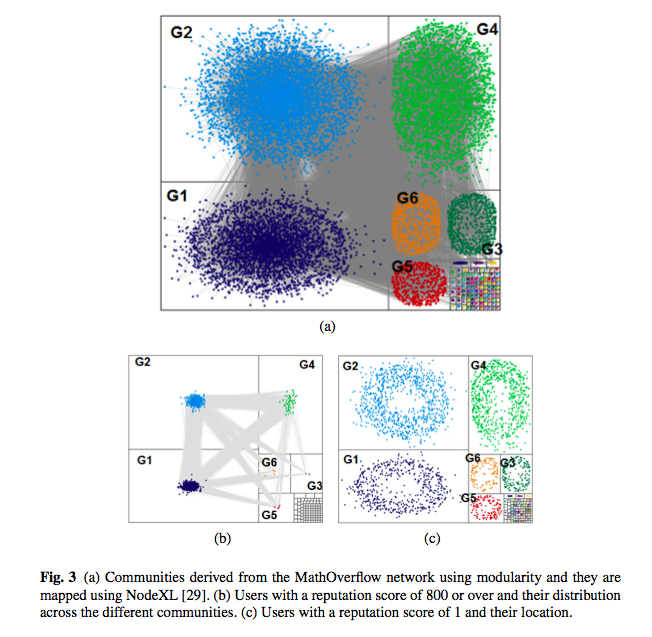 This paper presents an academic web community, MathOverflow, as a network. Social network analysis is used to examine the interactions among users over a period of two and a half years. We describe relevant aspects associated with its behaviour as a result of the dynamics arisen from users participation and contribution, such as the existence of clusters, rich–club and collaborative properties within the network. We examine, in particular, the relationship between the social achievements obtained by users and node centrality derived from interactions through posting questions, answers and comments. Our study shows that the two aspects have a strong direct correlation; and active participation in the forum seems to be the most effective way to gain social recognition. Page 10 has a description of the clustering that can be observed on MathOverflow. Most of the clusters are quite small given that 61% of the clusters has just 2 users, see fig. 3(a). The map representing the 105 clusters in the network displayed its 6 biggest groups (denominated as G1, G2, . . . , G6) and the small box in the bottom right corner contains 99 clusters with a total of 297 nodes. Also, the 6 clusters have 97.5% of the total users in the MathOverflow network. The subgraphs (clusters) diameter, average geodesic distance and density were calculated for the 6 clusters, in order to characterise them. Cluster G2 has the same diameter than the whole network (7 edges). Clusters G6 and G3 have a diameter of 11. The six clusters show a density lower than 0.006 which is bigger than the density of the whole network (0.0014), although they are significantly low given that the density provides the ratio of direct ties in the network to the total of possible direct ties . The 6 biggest clusters have a small proportion of users with the highest degree values and the highest upvotes counts, with a relevant proportion of users with low degree value and upvotes as followers. The users with a degree higher than 500 or upvotes higher than 750 or with the highest reputations are located only on the 6 biggest clusters (see fig. 3(b)). In contrast, users who have achieved a reputation of 1 (which is given when users input their personal details on the community web page) are located in the biggest clusters as followers of the main users and in the small clusters, Fig. 3(c). Specific subgroups in the network were identified based on the tags (topics) the users marked their questions with. When analysing the 3 subgroups with highest number of users (AG–Algebraic Geometry, SQ–Soft Question and NT–Number Theory) they appear to have similar network characteristics as the whole network. These subgroups contain 20%, 19% and 18% of the total users in the network respectively. The subgroups AG and NT have a diameter larger than the original network, which means the farthest two nodes in AG and NT are more distant; whereas the SQ subgroup has the same diameter as the original network (see Tab. 2). It may seem unusual that the authors identified soft-question as a subgroup but note that their methods are purely algorithmic and not based on any predefined mathematical taxonomy. On the other hand, it is not surprising that the SQ graph is similar to the whole graph while AG and NT graphs are somewhat different. It would be relatively straightforward to build the 'coauthorship graph' (treating each page as a work, including or not including comments according to preference). Are there then standard ways to answer your question based on this graph?